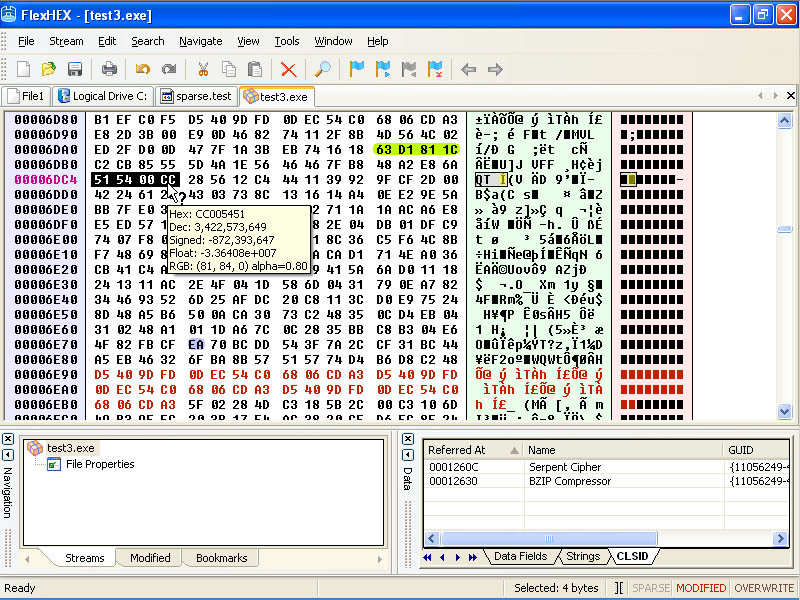 FlexHEX is a full-featured hex editor designed to edit binary files, OLE compound files, logical devices, and physical drives. With FlexHEX you can inspect, modify, insert, search, or replace binary, ASCII, or UNICODE data. In addition to the powerful editing functions, FlexHEX includes an unlimited Undo/Redo feature, so you are never at risk of losing your data because of a typing error. Powerful navigation and tracking functions make browsing binary data easy and convenient. File navigation cannot be simpler - you can always keep track of your position with bookmarks, area lists, jump history, and other handy tools. No matter whether your file is huge or tiny, FlexHEX handles it equally efficiently. You can open, save, paste, or drag-and-drop hundreds gigabytes of data in a wink of an eye. FlexHEX provides full support for advanced NTFS features, such as alternate streams or sparse files. Now you can edit the hidden data other hex editors simply can't see! FlexHEX has been designed to fill the needs of software professionals and you will find it powerful, convenient, and behaving exactly the way you expect it to. Native support for huge files up to NTFS theoretical limit. No matter how large the file is, FlexHEX handles it fast and efficiently. 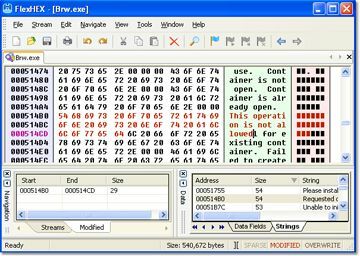 Unique features no other hex editor offers: OLE compound files, NTFS alternate streams, sparse files, and more! Interested to learn more? Take FlexHEX online tour.